News on the blog has been a little short lately. Not because nothing is happening, but because a great deal o my time has been spent working on various matters associated with our ‘Remaking Beamish’ project, not least the production of a report into the transport developments over the next four to five years. The team has also focussed on maintenance and ensuring that the site was ready for the Christmas Festival that is now well underway. 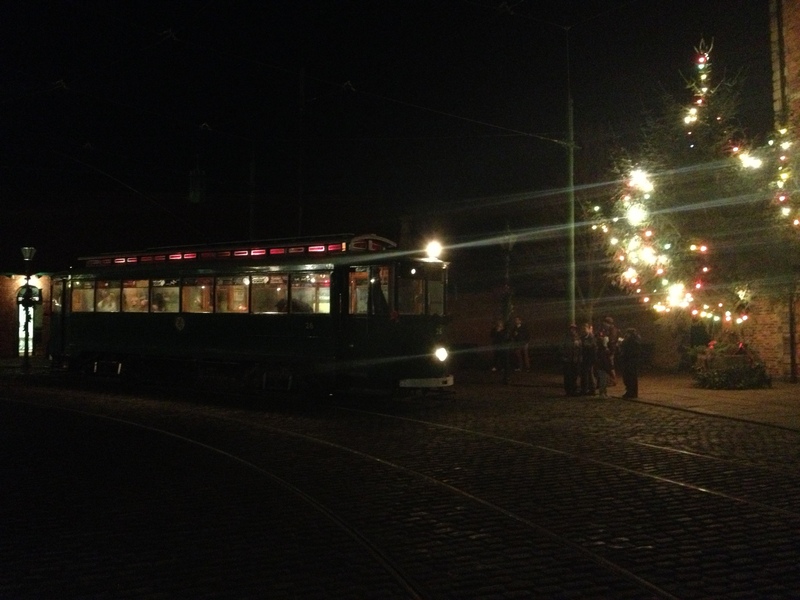 Below: To kick off, here is a photo of Gateshead 10 (still running as BR 26) during one of the Christmas evening events, where its large capacity has been a distinct advantage. The Christmas tree sets the scene as 26 waits in the Town. 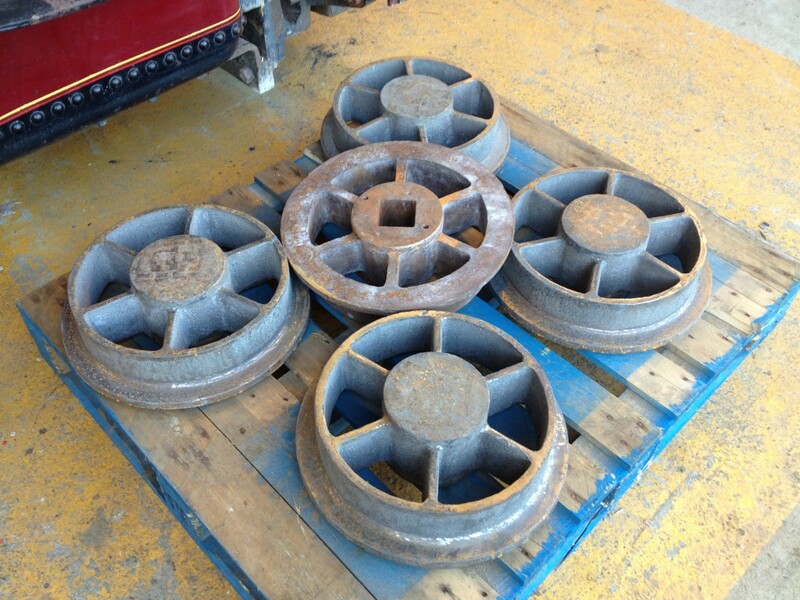 Below: Newly cast wheels along with the original, these being for Samson’s tender, which Matt the RHEC apprentice will be creating from the somewhat decayed remains of a lead mine tub. Its wheels are not reusable so new ones have been cast and will be set to the correct back-to-back (21 5/6 inches) for operation at Beamish and elsewhere. Axles are also in stock and we have patterns from old Colliery sources that will provide the plummer/bearing blocks. Below: Some of the volunteers have set about reinvigorating the James motorcycle that has languished around the RHEC area for some time now. 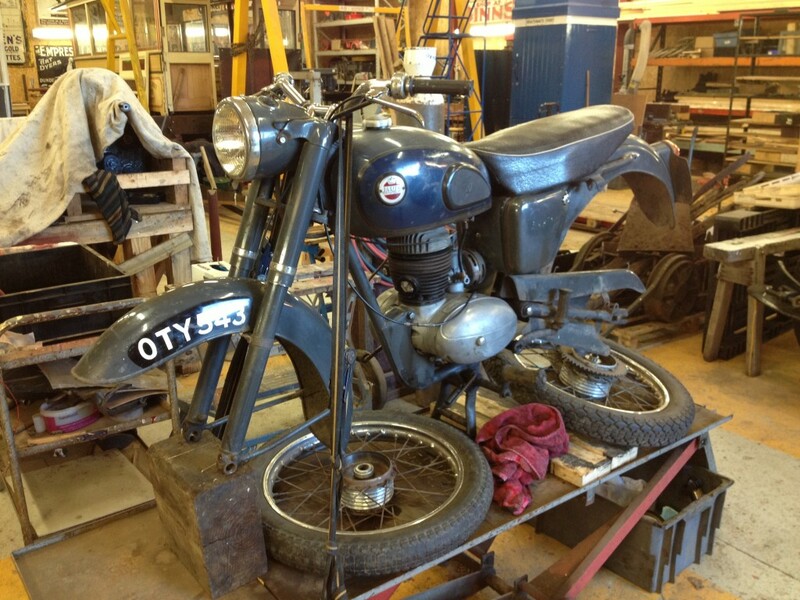 It is seen on the motorcycle stand as work commences. It will then join the pool fleet for use by suitably qualified staff for getting around the Museum. Below: The Friends volunteer team have produced a number of noticeboards and whistle sign boards recently. 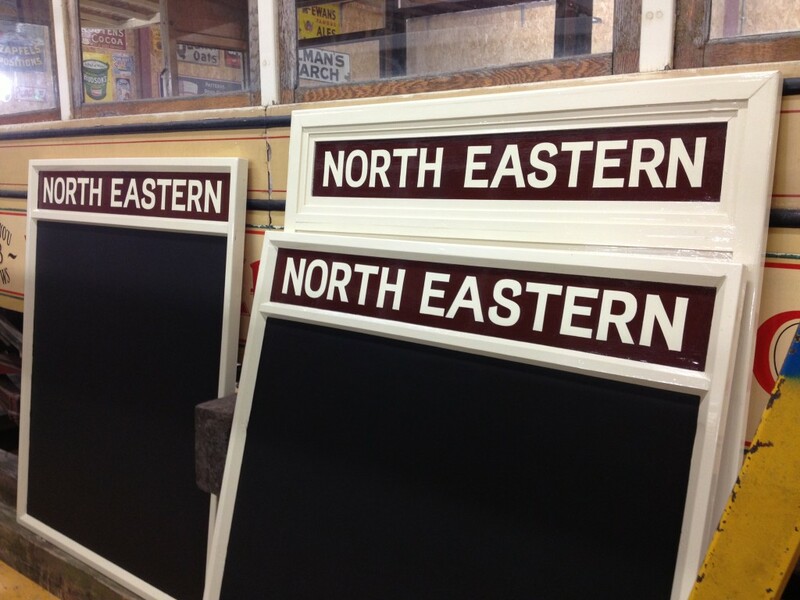 Three boards are for Rowley Station, as the start of a scheme to re-decorate and refurbish this exhibit and re-connect with the North Eastern Railway theme at the heart of it, perhaps a little occluded at times given the rolling stock currently in use. The two large whistle boards will also be installed at Rowley, whilst the smaller type are for the Colliery narrow gauge line, and will be mounted on rails to protect the cutting on both limbs of the triangle from the yard area. More signs for Rowley will follow, including a large one at the goods yard entrance and a goods office sign for the goods shed, which as far as I know has never had anything to identify its role in this area. Work is also being carried out on items for the new Colliery Engine Shed and the Roadmenders Depot. 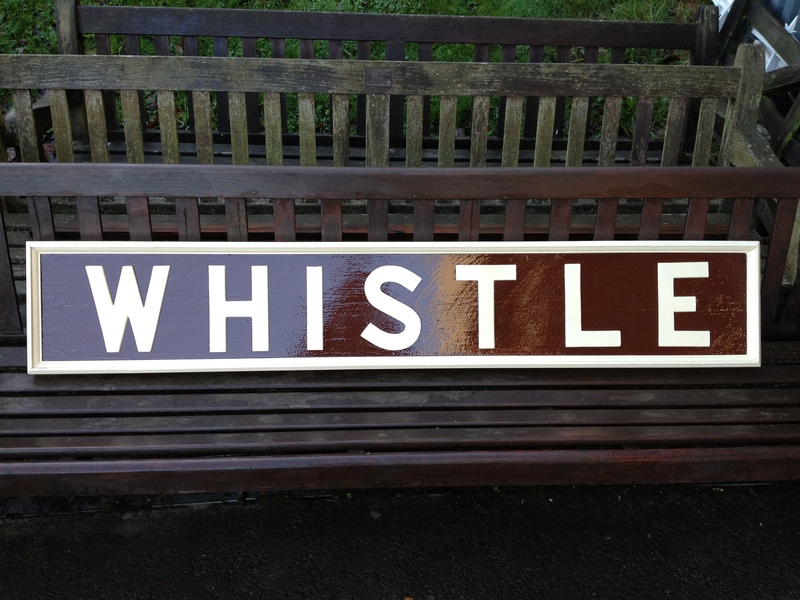 The signwriting is by Phil Anderson and Sarah Jarman, and a large number of tram depot signs are now complete and ready for instalment in the depot yard. Production of signs, doors and so on is hugely valuable to us and really helps set the period and scene. 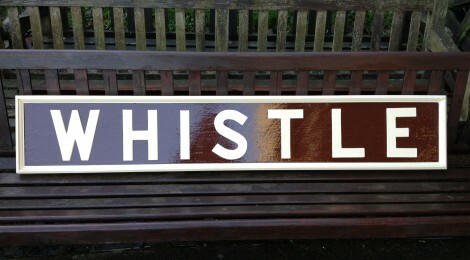 Below: A completed WHISTLE board, a refurbished original, which has been cloned to create a second board. Made by Clive and Owen and painted by Terry. The colour looks dark here, but is the NER ‘Chocolate’ (Chestnut) and cream. 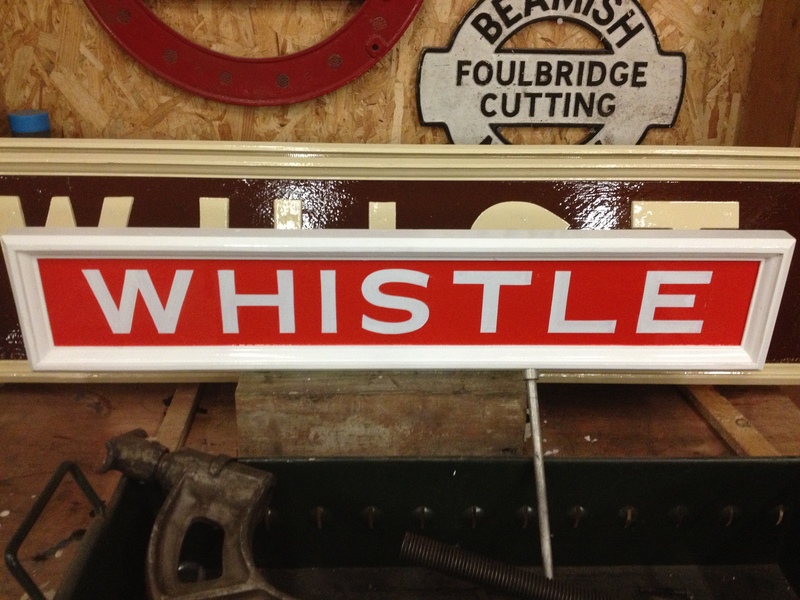 Below: One of the boards for the narrow gauge railway, finished in vermillion and white, awaiting varnishing. Below: We now have a full set of plates for R025 having been able to copy numerous plates from my own rollers a well a R025’s own iron pates which state its identity. Here the brass radiator plate is seen with the makers plate, along with spare alloy radiator plates that were cast at the same time. 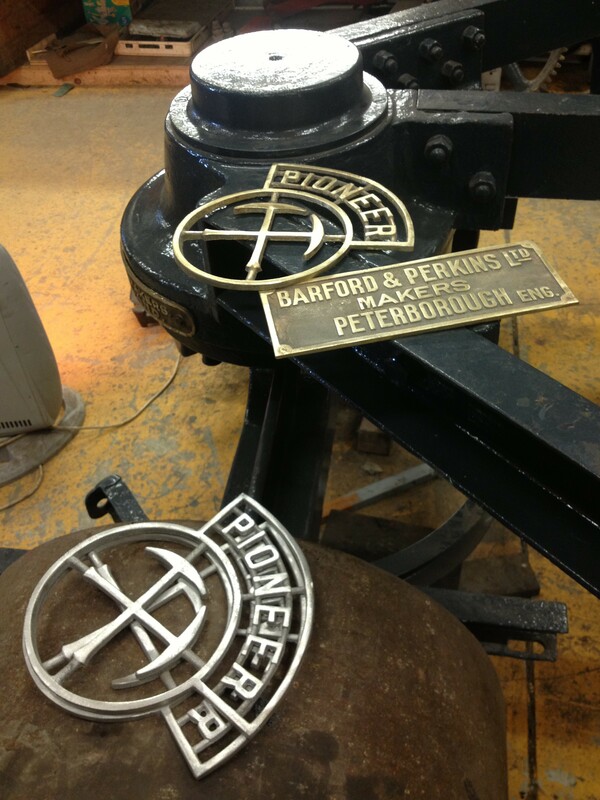 Smaller ‘Pioneer’ plates have also been cast along with a few spares. Below: A view of the Albion engine installed in the frames. 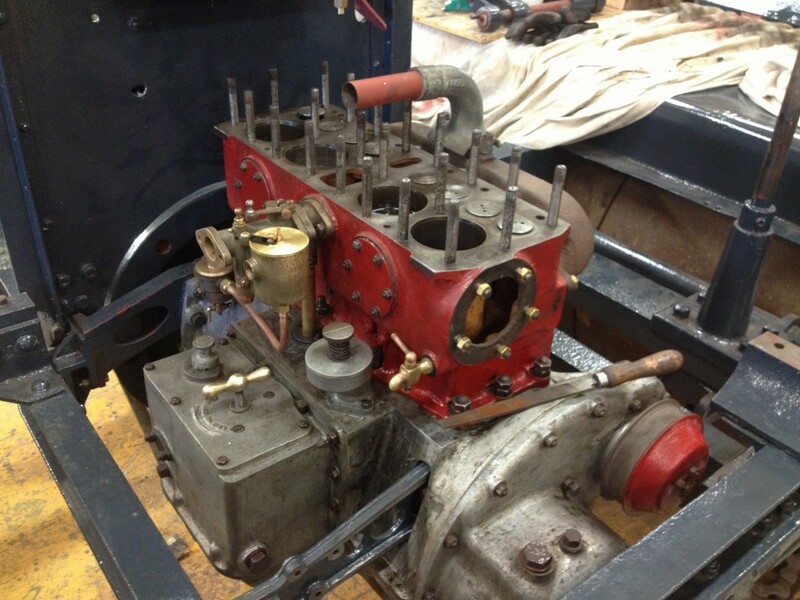 The exhaust manifold is temporarily fitted whilst the exhaust route is figured out (and we await copies of the original D4 drawings for this arrangement and the seat box which needs replicating). The cylinder head remains to be fitted, and will be finally assembled once the new valves are received, which are on order. The carburettor is seen in place an Chris and John are working out what is missing from the roller, not least a reversing crank (which also adjusts throw) for the Advance/Retard lever linkage to the magneto. The fuel tank and tap has been painted and fitted too. 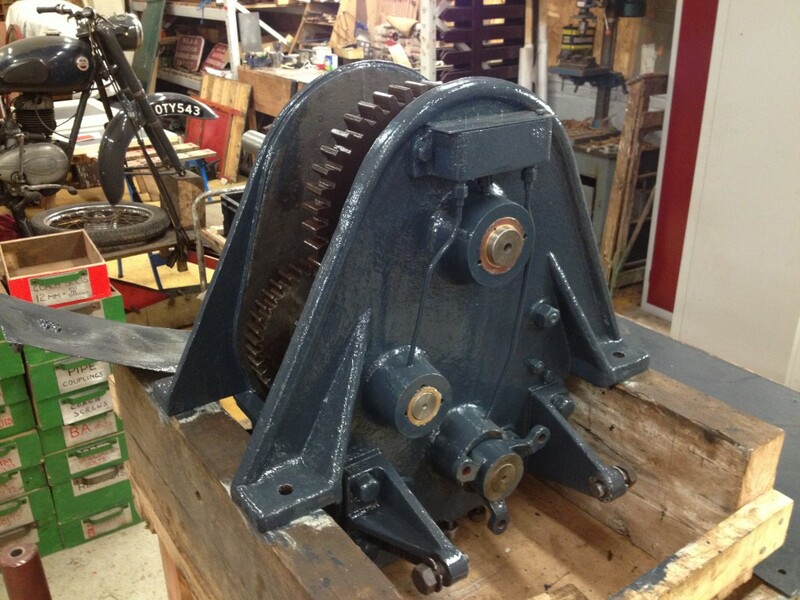 Below: The gearbox has been reassembled, following extensive work to the shafts. The gears are sound enough for reuse. New bushes are evident in the photo below. The gearbox cannot be fitted until the exhaust pipe is routed away from the manifold, through the bulkhead, around the flywheel, under the engine’s sump and up above the frame and eventually above the canopy. Below: Clive and his helpers have started making the platform decking for 49, whilst we finalise the brake gear arrangements. 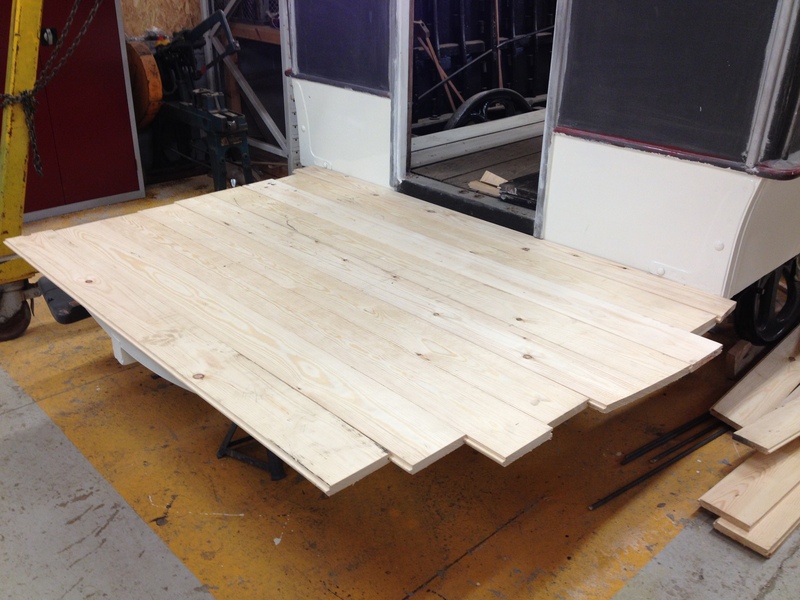 The boards are laid out here before trimming to shape. Elsewhere, varnishing has commenced of the doors and inner bulkhead panels – many coats will be needed to build up the required depth of finish, but early progress looks very promising. 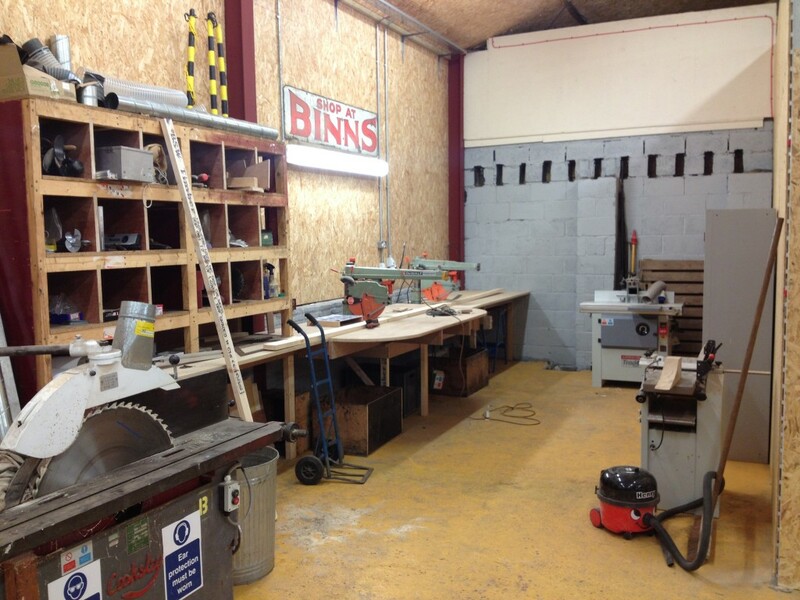 Below: Much staff time is still taken up with the reorganisation of the RHEC, with the new Timber Shop well underway, as seen here.